Anabiosis is a pictorial artwork based on the polychrome paper computing technology. 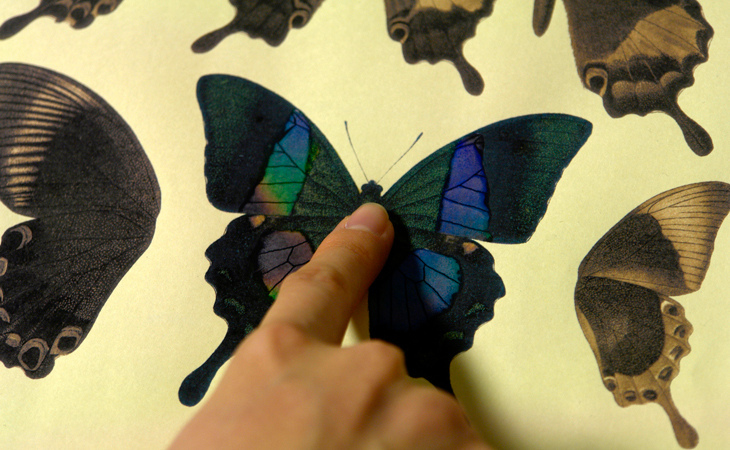 In this work, human touch gives the printed butterfly a color. Adalbert Seitz (1860-1938), an Entomologist of Germany, has edited "The Macrolepidoptera of the World", 16 part series of lithograph of butterflies and moths from the world. 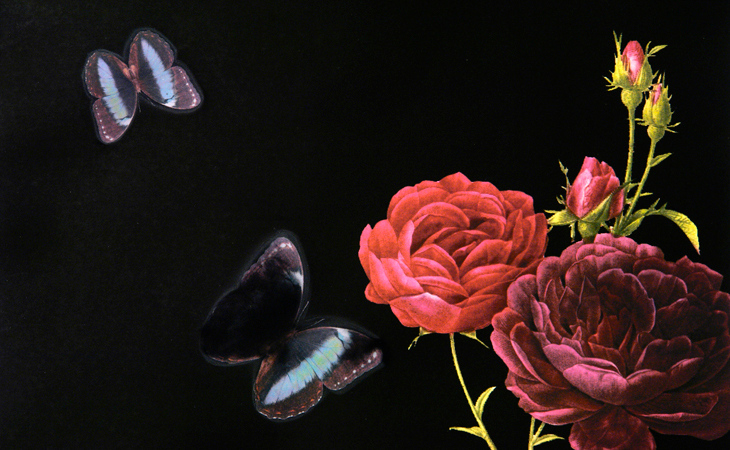 The butterflies created by Seitz, has a presence and beauty as if they are alive. 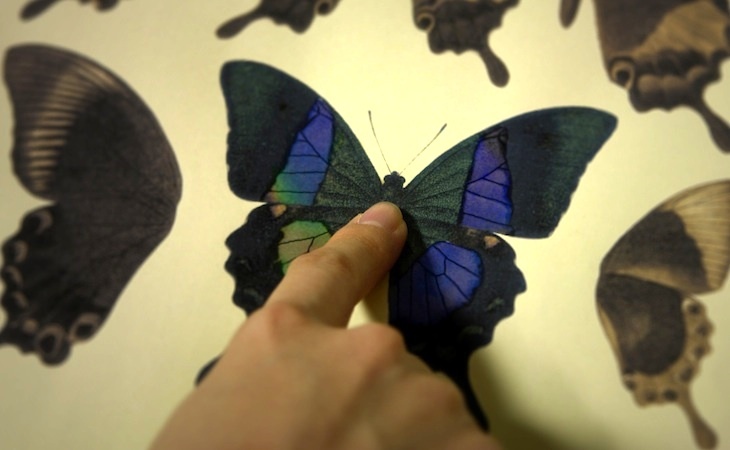 Anabiosis is developed to give a dynamic aesthetics to a beautiful butterfly Seitz has drawn on paper. 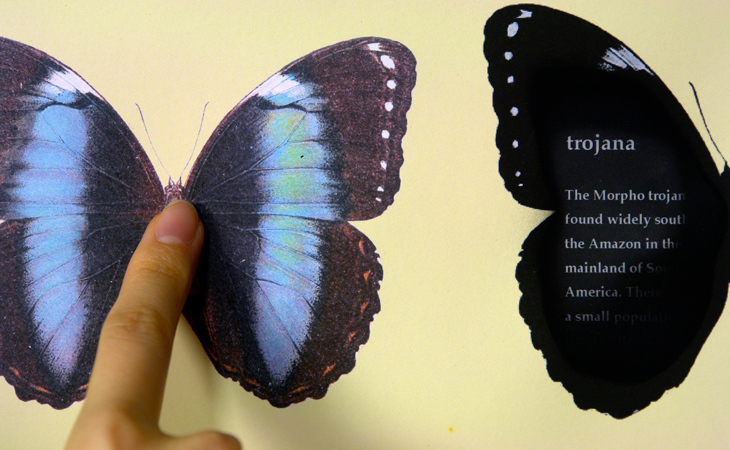 By touching a butterfly on a piece of paper, this gives a feeling of a resurrection by parting a life of human into a butterfly. The vision of our work is to fuse computer with existing printing techniques such as Ukiyo-e, calligraphy and lithography. By using existing printing techniques with paper computing technology, previous know-hows can be blended into the materiality of paper. We must remember that paper relates to many cultures, and have been playing an important role more than just as a recording media. When the paper gets the character connecting to computer seamlessly, a fascinating work which holds another beauty, will be generated. - Kohei Tsuji, Akira Wakita, Polychrome Paper Computing, ACM SIGGRAPH ASIA 2011 (Emerging Technologies), Hong Kong, 2011. - Kohei Tsuji, Akira Wakita, Anabiosis: An Interactive Pictorial Art Based on Polychrome Paper Computing, ACM ACE 2011 , Lisbon, Portugal, 2011. Gold Award (Interactive Art). - Kohei Tsuji, Akira Wakita, Anabiosis: A Pictorial Art Based on Polychrome Paper Computing, 2nd International Workshop on Organic User Interface (OUI 2010), Funchal, Portugal, 2010. - Anabiosis - A Life on Paper,Asia Digital Art Award 2011, Interactive Art, Finalist, 2011. - 辻 航平, 脇田 玲, Polychrome Paper Computing: 機能性インクを用いた多色刷りによるペーパー・コンピューティング, 情報処理学会ヒューマンコンピュータインタラクション第144回研究会, 2011年7月29日, 富山. - ENERGY SISTEM, Brasil,Touchscreen de papel muda de cor com toque, Dec. 20, 2011.